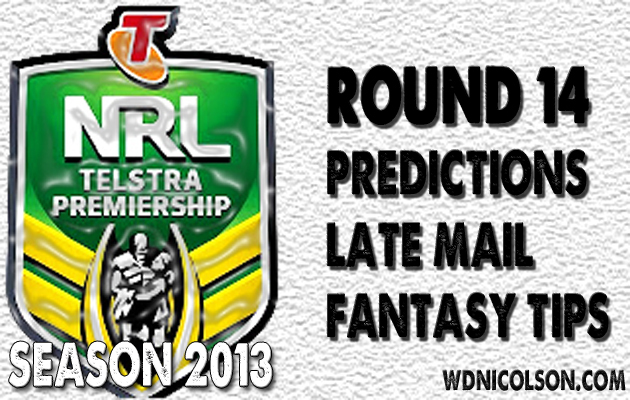 For our analysis of Tuesday team selections for Round 14 - click here. The Postman has just some NRL Dream Team and NRL Super Coach gems for you this week - with all teams playing and a few Origin spots seemingly up for grabs..
Voting Allocation for Round 14 of the NRL is below. Things aren't going swimmingly for Manly right now... they've lost three of their last six and Daly Cherry-Evans had probably the most ineffective game I've seen him play in a long time against the Warriors - and they only lost by 2 points. Kieran Foran is playing well however and when both play well - Manly play well. It's not rocket science but those two in form keep Manly in every game. The Dogs counter with an up-and-down Josh Reynolds and the one dimensional Trent Hodkinson... biggest advantage is the depth of the Dogs' pack compared to Manly's right now but Manly dropped two games at Brookie to fellow contenders - Easts and Souths recently - they won't want to make it a hat-trick. Dogs capable but Manly is my pick with DCE the star - Manly by 7 points. SEA EAGLES: Brett Stewart isn't likely to be back until after the Round 15 bye people. If there is a change to the squad it'll be on the bench... with the player coming in lucky to get more than 10 minutes of game time - if that. The Postman's DT/SC TIP: Daly Cherry-Evans is a beast at halfback in DT and a good but not great SC halfback... He's a must in DT and is a nice POD in SC... but then again he might be on the bench for QLD in Origin 2 or 3... but note: he will be on the bye for Origin 2/Round 15 anyway. BULLDOGS: The Dogs are looking might fit right now... Mitch Brown's snoz is twice the size but he's fine. There's a chance Josh Jackson could start for Tony Williams. Tim Browne will remain 18th man. LATE UPDATE? Jackson/Graham start for Williams/Kasiano. The Postman's DT/SC TIP: You know you want to trade Tony Williams in... but you should know that he's a pick and stick or not at all option in Fantasy land. We prefer the not at all option in 2013. DRAGONS: Matt Cooper could be a late addition... and if he does - Leeson Ah Mau or Nathan Green would miss out. Jamie Soward will not play first grade. COWBOYS: James Tamou sits out for a fortnight for off-field stupidity. Scott Bolton will start and as suggested on Tuesday on our NRL Injured List - Gavin Cooper will travel with the team. Johnathan Thurston will be given right up to kick-off to be fit, with Ray Thompson to shift to five-eighth if JT can't overcome his groin problem. LATE UPDATE? Thorby in for Tamou, Sims starts. The Postman's DT/SC TIP: No standouts here... so move along. And I know Robert Lui went nuts last weekend... don't rely on him repeating that anytime soon. Canberra... I guess. The Panthers started fast against the Tigers before forgetting what it takes to win - playing the second 40 like the first, but the Raiders fell into that category as well against Brisbane. The Panthers led 18-4 at HT, Canberra 24-6 at HT... that extra Canberra try probably got them home as well. With Terry Campese running things Canberra can be good... question is - will they every attempt to play good clean attacking footy for a whole match? Do that and despite Penrith's best efforts - this could be 40-12 scoreline. But don't trust Canberra to do that... just pick the Raiders by 8 points. RAIDERS: Edrick Lee has a broken arm - played 15 mins with it broken v Broncos - so Sandor Earl replaces him, expect Jack Wighton to move to left wing so Earl can play right. Everyone else expects to play. LATE UPDATE? Not expecting any changes. PANTHERS: The Panthers could have a reshuffle in the backline on gameday with Josh Mansour going to the wing. Clint Newton has struggled in recent weeks, so Ryan Simpkins might come in from 18th man. MOYLAN IS FREE! Matt will replace Wes Naiqama at fullback after Naiqama's ankle injury and the salary cap auditor clearing Moylan to play. Tim Grant (hand) may also try to get on the bus to Canberra, as playing may be his only way into the NSW team. 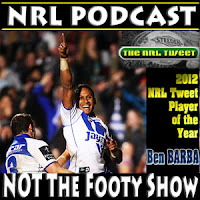 The Postman's DT/SC TIP: What to do with Matt Moylan? Right now you should be covered for Round 14 in terms of outside back depth... so wait another week or two before you cut him loose. He's FREE! Will play Canberra. Think Paul Gallen won't have a big one here? Didn't think so... Parra need Chris Sandow to have one of those days he hasn't had since he started playing in the NRL - such is the task at hand. I mean it is not like the Sharks are coming off a belting on the road or anything... Mind you, not convinced the Sharks win by 30 or anything, but it'll be more embarrassing getting dusted by a point at home by Parra than going to Melbourne and getting beat by 32 points. Sharks by 18 points. LATE UPDATE? Bryce Gibbs will play NSW Cup. Gordon is out, Stapleton is the new fullback. Ross also misses out, with Tagataese preferred. The Postman's DT/SC TIP: Paul Gallen after this weekend will be cheap next time he plays... downside is that'll be Round 16. So wait... let his big BE this week bring him down a little more... he needs 154 in SC and 93 in DT... even if he reaches either - he's still a bargain now anyway. But wait til Round 16. EELS: Jacob Loko was a naughty boy by not turning up to training so he's playing NSW Cup this week. Ben Roberts needs to either start or not play first grade... so don't be surprised if Joseph Paulo moves to the pack and Roberts does start. The Postman's DT/SC TIP: Keep Jarryd Hayne if you have him - he's in your best 17 after Origin and it's not worth the two trades to send him packing now. If you don't have him - he's a tasty 270k in SC and 300k in DT with gettable BE's the week he returns. PS - Jake Mullaney will score well at FB (thanks to tackle breaks) but he is too expensive because of his scores last year to bring in as a temporary option. South Sydney had a nice break... as did Greg Inglis. The Titans had a break as well - some good planning in the schedule gave both these sides the bye in Round 13 before they both fly to Cairns for this game. The Gold Coast pack remains as good as any on paper and you have to like how they play their footy from time to time - stark contrast to recent years of boring wait for the kick on the last game plans - but you are a brave tipster indeed if you pick them against the Bunnies. Souths by 12 points. RABBITOHS: The Rabbitohs probably don't take 20 players north, with coach Michael Maguire needed to trim a 7 man bench. Luke Keary, Josh Starling and Justin Hunt look the most under threat but Maguire is normally pretty ruthless if he thinks more established players aren't doing the job. The Postman's DT/SC TIP: Do you keep George Burgess? With Tackle Breaks worth 3 in DT - you almost have to (even though his tackle count isn't going to pass 30 max), and the value of big attacking plays in SC (tries/line breaks) make him SC gold... post Origin reconsider it but only if you are trading him to Woods, Fifita or Merrin. TITANS: Brad Takairangi will play after a head knock two weeks ago, 18th man Ben Ridge is cover for a few forwards who have had niggles in recent weeks. Luke Bailey should play despite a hip injury. LATE UPDATE? Ridge comes in for Minichiello (hamstring). The Postman's DT/SC TIP: Mark Minichiello and William Zillman both have negative BEs this week in SC... Zillman's line breaking ability keeps him in the SC conversation but neither can in your final 17-20 options. So unless you have lots of trades left don't do it. Melbourne if the Big 3 play... if word comes out one or two of them won't - I'll write an actual preview. Storm by 20 points. STORM: Will this be the week Craig Bellamy gives one of his stars a pre-Origin break? Don't rule it out. Bellamy isn't a fool - he knows getting his best players through this rep period as fresh as possible matters when we get to the pointy end of the season rather than a meaningless Round 14 clash with Newcastle. LATE UPDATE? Cronk might get getting a rest... with Finch coming in. The Postman's DT/SC TIP: Gareth Widdop woke up last week and the Storm don't have their next bye til after Origin 3... but you still can't pick him. And the other alternative - Ryan Hinchcliffe should (I hope rather because Ennis is NOT the answer) get the call if Farah is out of Origin 2... if you haven't traded Tohu Harris yet - I still think you need to. Ideally for a player with a good bye situation. KNIGHTS: Don't rule out Akuila Uate being a late inclusion here... oh and a guy called Craig Gower. Uate would replace Kevin Naiqama, while Adam Clydsdale would miss out if Gower plays. Neville Costigan will replace David Fa'alogo (knee) on the bench. While Adam Cuthbertson and Danny Buderus have - along with Uate - trained with the team on Thursday. LATE UPDATE? Uate, Gower and Cuthbertson into squad, Fa'alogo, Costigan and Clydsdale miss out. The Postman's DT/SC TIP: Jarrod Mullen might not stay this cheap in DT for a while - plus he dominates kick metres for the Knights. Showing the value of big attacking stats in SC however - his $196,700 SC value is 150k less than his DT value. Yes to DT if you want a POD half, no to SC. Good luck to the Warriors - they've won 3 in a row... but there's no way I'm tipping them against the Roosters at the SFS. Sydney coach Trent Robinson will be ropeable with his team's application against the Eels (they won by 14 points and scored 38 - yet sucked) and this week will be all about defence and not letting the Warriors play second phase footy... 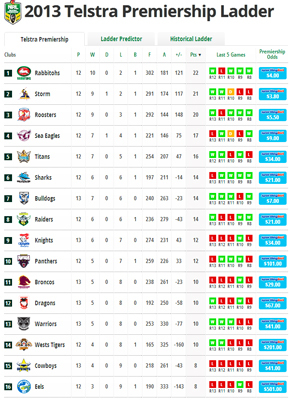 The Warriors might have a moment or two - but I'm sticking with Easts by 16 points. ROOSTERS: Boyd Cordner challenged a 1 week ban on Wednesday night and won. So the Roosters are probably 1-17 with Sam Moa is probably another week away. The Postman's DT/SC TIP: Nothing catches the eye... bar Isaac Liu who went up big time after his 3rd game last. Problem is - he loses his spot once Sam Moa comes back so you needed him in your team a long time ago to get any value. WARRIORS: The big bench is either smart cover come Sunday night - or a smokescreen for the return of a few injured players like Todd Lowrie. Good thing about the Warriors is if they smokescreen Tuesday, they clear things up by the end of the week. Kevin Locke and Russell Packer should be back after missing last weekend. LATE UPDATE? Locke is out, so Fisiiahi is your fullback and Laumape is your winger. Packer flies to Sydney... did Lowrie? The Postman's DT/SC TIP: Pop Quiz: Name the highest PPG Warrior in SC? Despite a late surge it isn't Feleti Mateo... or Shaun Johnson. It's Thunder Thighs Konrad Hurrell... but given his ability to follow a blinder with a shocker... you can't take the risk right now. Give the Tigers credit - they fought back and deserved to beat Penrith last week. Don't give the Broncos any credit for their 2nd half against Canberra... they were well beaten at halftime (but then again - weren't the Tigers?). Benji Marshall represents the Tigers main hope at an upset... while Brisbane should get Ben Hannant back which is a big inclusion in terms of the balance of each forward pack. Wouldn't want to be picking Brisbane if this was in Sydney, but back in Brisbane with another 7 day break and a group of QLD players desperately seeking that winning feeling going into Origin 2... that's the factor I'll follow here. Broncos by 4 points... maybe. BRONCOS: Do we see changes after another loss? Problem for the Broncos is they are only really missing David Stagg up front, if Ben Hannant plays as expected. There could also be a change on the wing with Jordan Kahu not looking 100% against Canberra. LATE UPDATE? Kahu out, Maranta in. Hannant a certain starter. TIGERS: Blake Ayshford expects to return, and David Nofoaluma hopes to overcome an ankle injury to play as well. Don't rule out James Tedesco replacing Sean Meaney at fullback either. Robbie Farah won't be back early, he'll be saved for Origin 2 if he's able. LATE UPDATE? Nofoaluma is fit. Tedesco and Fulton play, Meaney and Farlow miss out. Farah will NOT play. The Postman's DT/SC TIP: The kid you wanted (or had and thought you were a genius) Aaron Woods might be playing Origin 2... has the bye for Origin 3... geeeesh. Upside is when he plays he is SC royalty and a DT gun... just you won't have him for at least one of the two Origins that are left... if not both. What are your tips for Round 14?